"How Important are First Impressions to You? 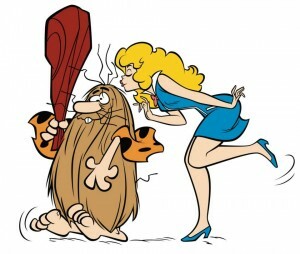 Captain Caveman Unearths the Truth"
Your inner caveman holds the key. Did you know that it takes just 7 seconds to make a first impression? These findings were reported by researchers from New York University and show how the moment a stranger first sees you, his or her brain makes a thousand quicksilver computations. Are you trustworthy or reliable? Yet what does the importance of first impressions have to do with your strength training? You see, back in the 1960s there was an exercise system that took a bodybuilding wrecking ball to world records in all sports, knocking them over like skittles as it transformed once weaklings into weight room gods. Yet as amazing as this might seem, there was also something else. In fact, this one thing is so unbelievable, that it will likely halt you dead in your tracks. lifts that took just 6 seconds. And, no. That is not a misprint. In less time than it takes to make a first impression, these lifts took a mere 6 seconds to build Superman strength. I write about this system in 6 Seconds to Strength. To learn more, just click the pic of "Cavey"!